I find it unbelievable that today is November 1st! September came with a flurry of activity that spilled into October and I am just now catching up! I didn’t mean for time to escape me in such a way. So much has happened in the past few months and I have so much to write about, but for now I will just continue in Order. Cody and Alycia were married on Sept 15th this year. They met with me earlier in the year to make plans. After meeting them and hearing of their plans I was so excited about their wedding that I made the difficult decision of not being at Art in the Park so I could be at their special day. I have been a part of Art in the Park for 8 years in a row. And I have loved it every year. But with new artist markets opening up around me I have found other opportunities to sell art so it worked out. Cody and Alycia’s wedding was so pleasant there is really no where better to have been that day. 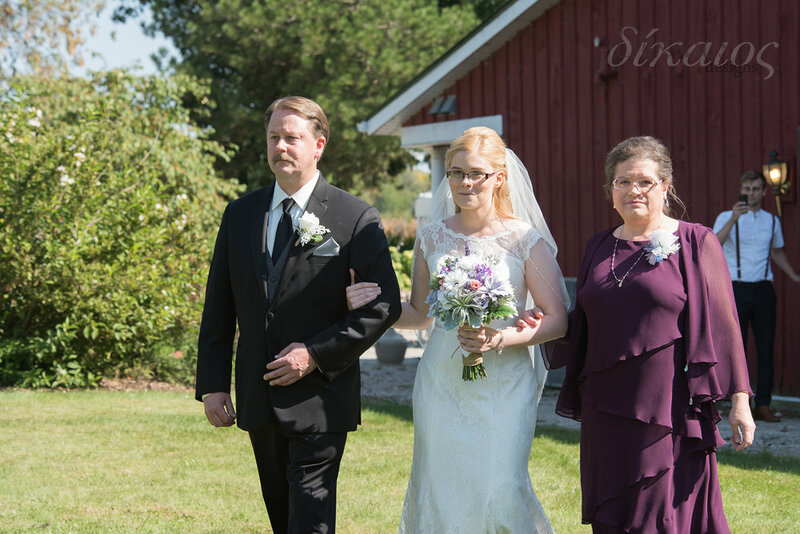 The wedding was at Homestead Meadows in Appleton. It was a surprisingly warm Fall day, we all had to apply bug spray and the wedding party hung out in the Air Conditioning. It was a fun way to remember Summer one last time. Stephanie was with me for the wedding. When we arrived she went with the guys and I with the girls. There was one long building that was divided with rooms, they could be near each other but not see each other. The girls dresses were so unique with such a wonderful color scheme. Guys get ready so quick! I think the best man is reading over his speech. Before the wedding there was time to capture some deets. They gave everyone such beautiful hanky’s, that’s so much more fun then just tissues. Then came time for everyone to gather and the wedding began. Watching from afar. Awaiting the moment. You can tell by her smile this is the moment her and Cody really looked at each other. I love this moment. They did an official “Tying the Knot” and had rope wrapped around their hands to bind them together. It was cool. Following the ceremony we did family and bridal party photos along with a a few of just the two of them. It was so buggy that Alycia was super happy to have her own netting, lol. A dip and a kiss. By this point they became naturals in front of the camera. After photos there was a little the couple to socialize and us to get detail shots of the decor before heading to the lower level of the barn for a delicious meal. The upper level of the barn with the dance floor. Then it was time for everyone to come in and eat, the bridal was announced as they entered. After dinner was the cake cutting. It was a beautiful cake. Thanks you’s followed by speeches. Her dad. His speech was great. He shared how one of his co-workers had mentioned how difficult this day would be and dad said he was joyful and celebrating because he knew his daughter was with Cody, who is definitely Mr Right. So sweet! We were able to sneak away during the golden hour. We got some beautiful shots in that moment. Shortly after this, the dance began and they danced the night away. I know I live in a fairy tale bubble. But to me they really are the perfect Prince and Princess in this love story. There was so much dancing, laughter, mingling, and all around celebrating. It was a beautiful event. We were honored to be there and to get to know Cody and Alycia.